I found this illustration at Ultra Swank, a "retro living" site, and the more I look at it, the less sense it makes, even in a late-1950s Your Friend the Atom sort of way. Admittedly, its purpose was to sell whisky, not to advance agronomy. 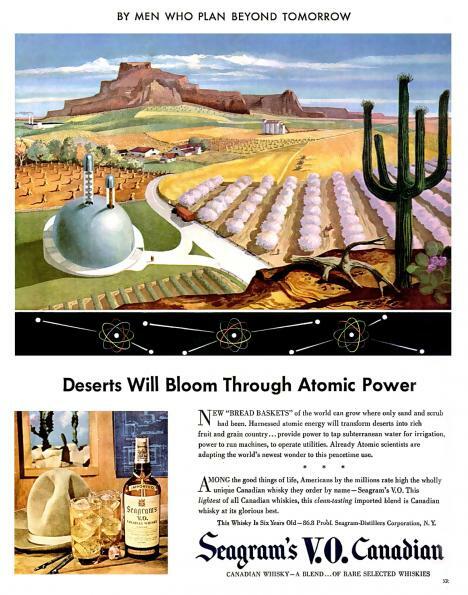 But still, how would "harnessed atomic power" transform anything? Generating electricity to pump water? Irradiating crops? Whatever the technology, it is clear that "men who plan beyond tomorrow" will still wear "Montana peak" hats. And you had to have domes, because domes symbolized The Future. That meme was firmly established, which is why, I suspect, that geodesic domes had their moment of popularity as living spaces in the late 1960s—1970s. Despite their numerous disadvantages, building a dome proclaimed that you were planning beyond tomorrow. Getting More Water — by Magic?